These little cardboard pop-up pots are perfect for Halloween party décor or for stashing candy around the house - why save it all for the trick-or-treaters? Half the fun of Halloween is the permission to eat loads of candy, right? I used Joy embroidered letters to make cute little signs to remind us that we are not eating our veggies like we should. 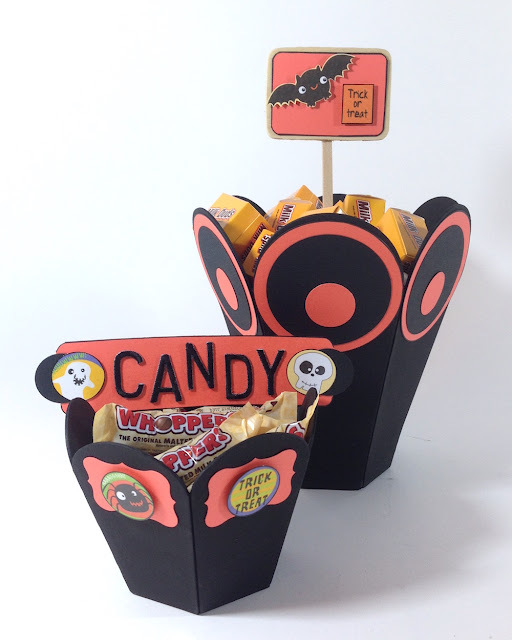 Click here for more details - with a couple punches and a sheet of Halloween-themed cardstock, you'll have some sweet candy dishes in no time. 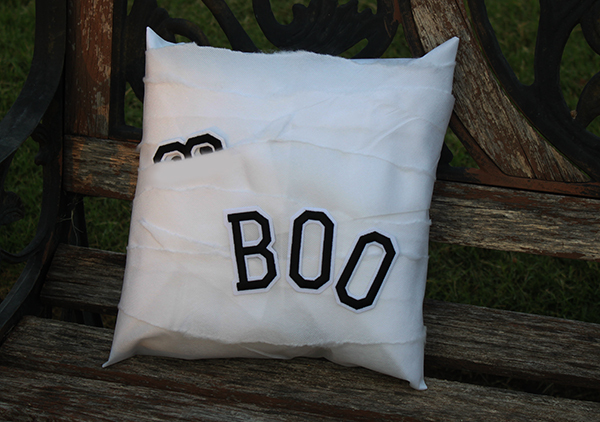 This pillow is a quick and easy no-sew Halloween decoration - add a touch of mummified fun to your porch, patio or family room. 1. Place the pillow at the center of a 20" x 28" piece of Oly*Fun material. Wrap it as if you were wrapping a gift and glue the ends in place at the back. 2. Tear 3" wide strips from another sheet of Oly*Fun. Wrap the strips around the pillow in layers then overlap and glue the ends together at the back. Note: Oly*Fun is a tear-resistant and material, so make a snip with scissors to start, then tear it slowly. It won't fray and it withstands the outdoor elements, so it's a great alternative to fabric for this project. 3. If you're using your pillow as an outdoor decoration, spray it with glow-in-the-dark paint and let dry. 4. 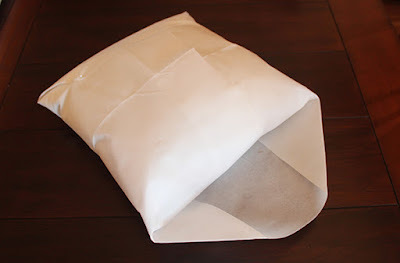 Remove the backing from each letter to expose the adhesive then attach to the pillow. It isn't necessary to iron in place, since this project is for decorative purposes only (plus Oly*Fun will melt under the high temp of an iron). 5. Place a small, black button behind each opening in the number 8, then place horizontally behind one of the layers to look like a pair of eyes. Place your finished pillow either indoors or outdoors and enjoy! 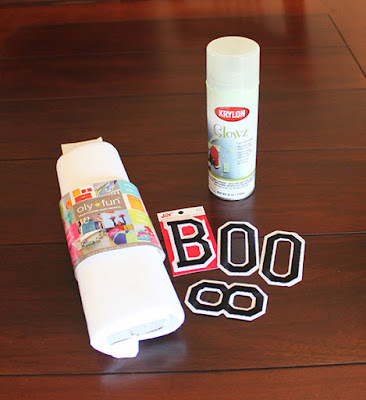 Fluorescent letters are the perfect accent for all your Halloween projects! 1. Paint the flags black and dab with orange. Paint the craft stick and fence white and dab with brown. 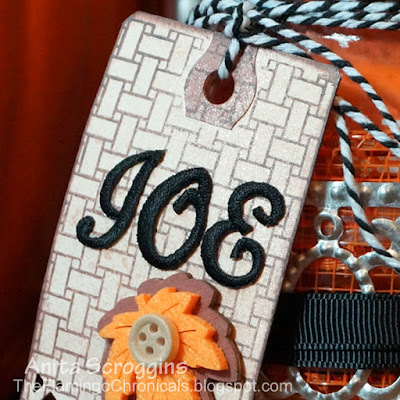 Paint the pumpkins orange with a gold stem and add curved lines with a toothpick in brown. 2. Snip the fence apart into two pieces. Bend and shape the fence to fit the wreath to create a broken look. Hot-glue one piece on each side, with one in the front and one at the back of the wreath. 3. Glue the JOY letters to the flags. 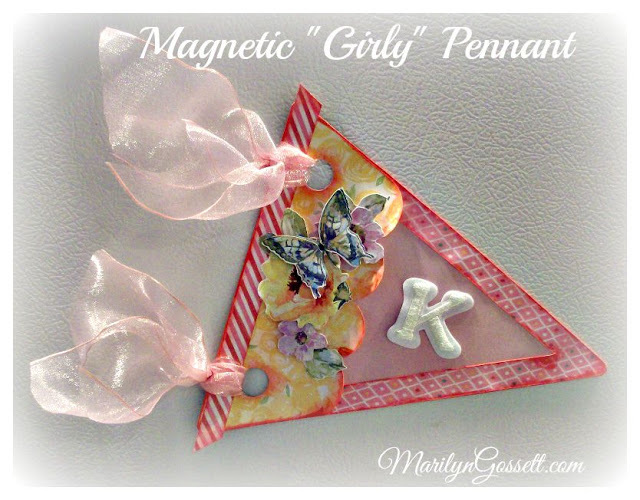 Cut a piece of gauze tape in half lengthwise and thread it through letters. Tie to the top of the wreath at an angle. 4. Glue some raffia and pumpkins in front of the fence. 5. 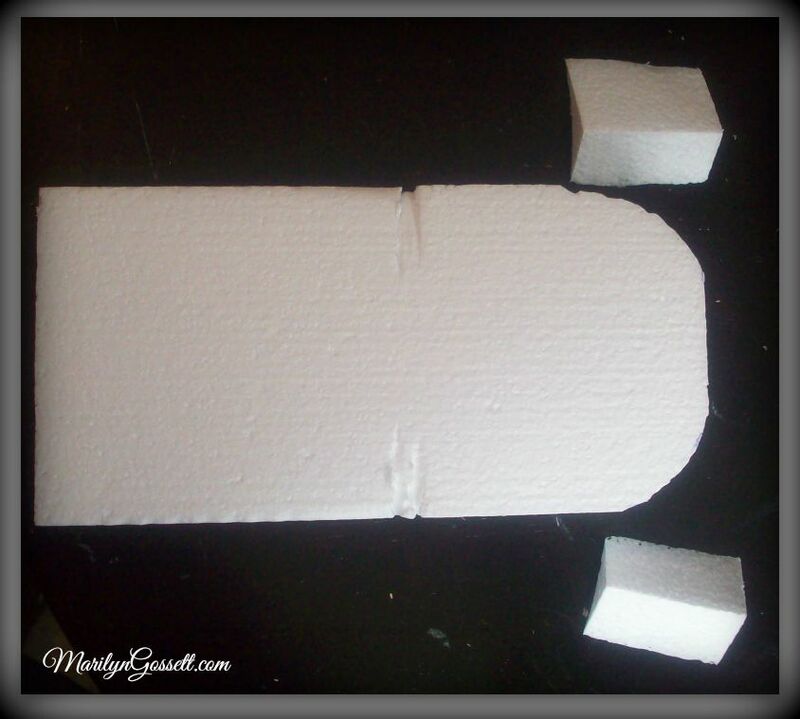 Cut lengths of gauze tape and glue to a craft stick. 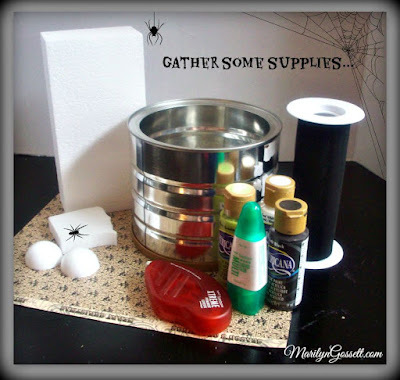 Add a pair of google eyes to the ghost and glue to one side of the wreath, behind the fence. 6. Cut off the front of the lunch bag and make 3 or 4 cuts in each end of the paper. Twist the bag into a tree trunk. Twist each narrow piece into branches and roots. Add glue to hold and dab with brown paint. Glue to the side of the wreath. 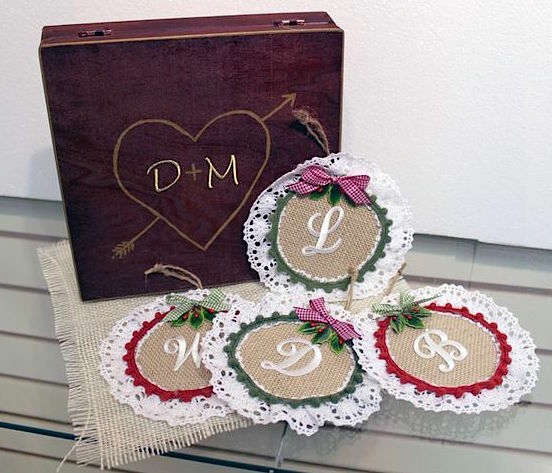 I love to give away treats on any and all holidays and creative packaging makes them extra special. When I am short on time, I always turn to mason jars - they are easy to decorate, reusable, and who doesn't like to get a jar full of goodness? 1. 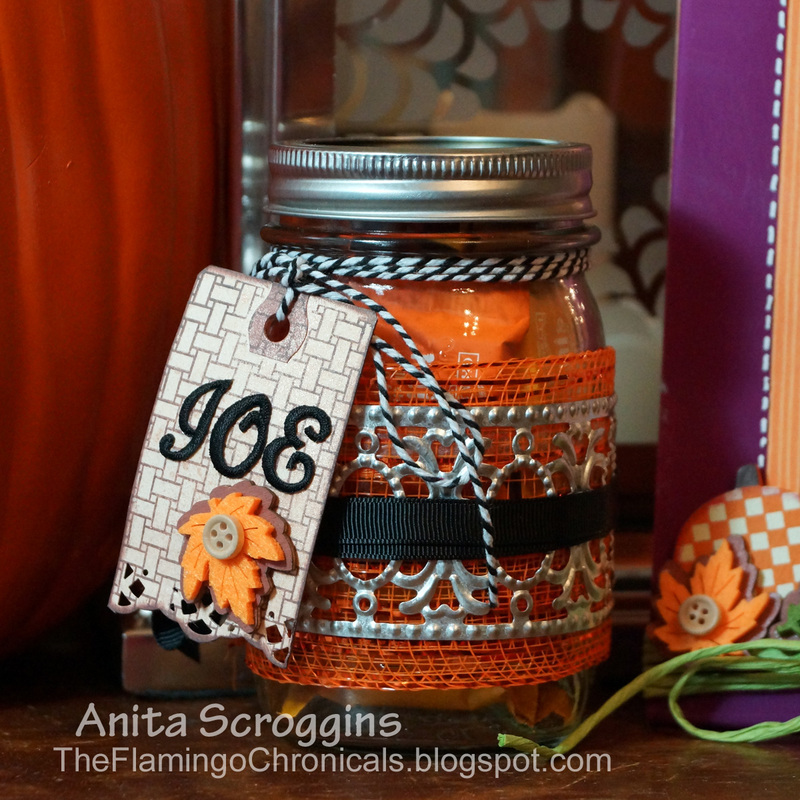 Use double-stick tape to adhere layers of ribbon around the jar. 2. 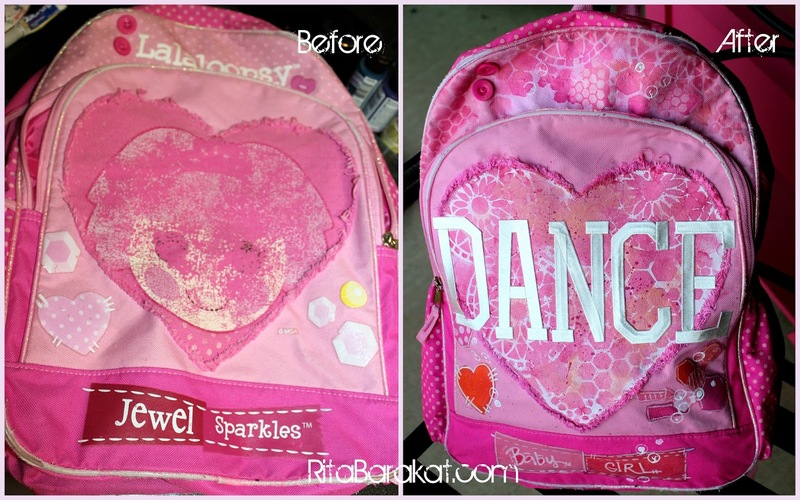 Spray the tag with iridescent ink, set aside to dry. Stamp a background image on the tag. 3. Use craft glue to adhere the letters to tag, add an embellishment and tie the tag to the jar just under the rim. 4. Fill the jar with candy and add the lid. Give the kids an extra special treat this year with their very own personalized trick-or-treat bags. Try putting a Halloween greeting in black lettering on one side, and the kids' names on the back using orange lettering. No more fighting over whose bag is whose! 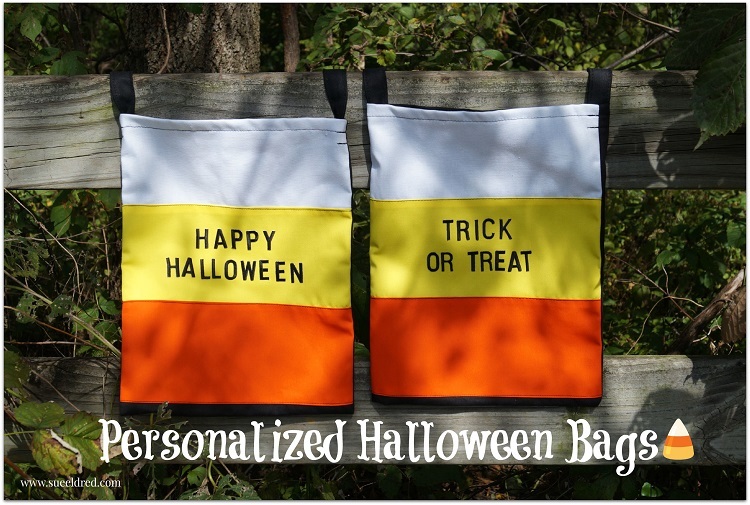 These cute candy corn bags came from Canvas Corps Brands. 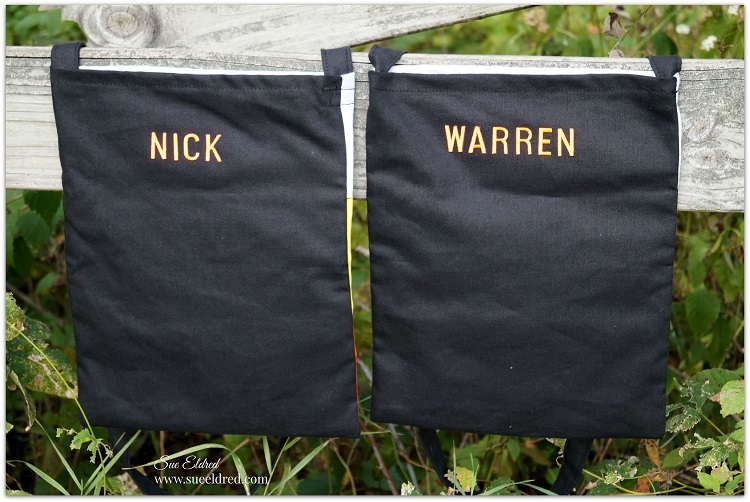 Just iron on your Joy letters to each bag and send the kids out there to fill 'em up! 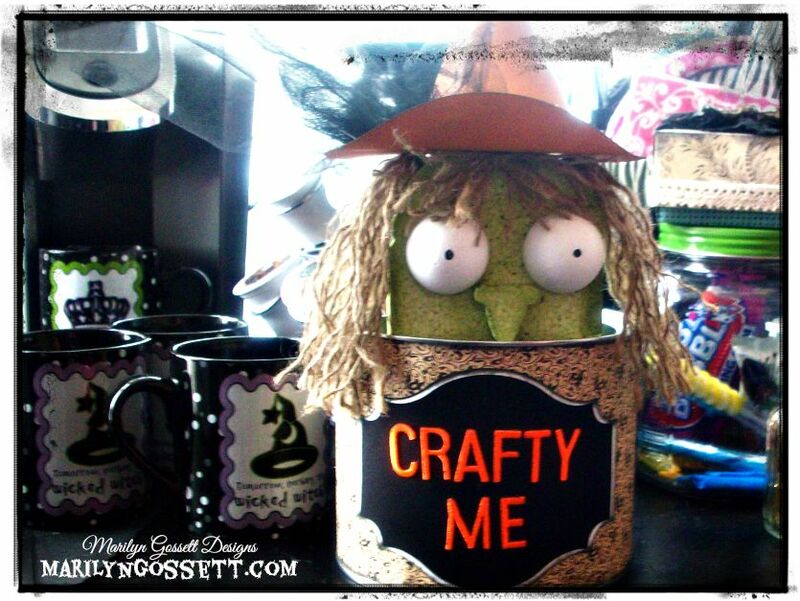 Yes, it's Crafty Me...peeking out to remind everyone that it's fall and time to get your "spooky" on! 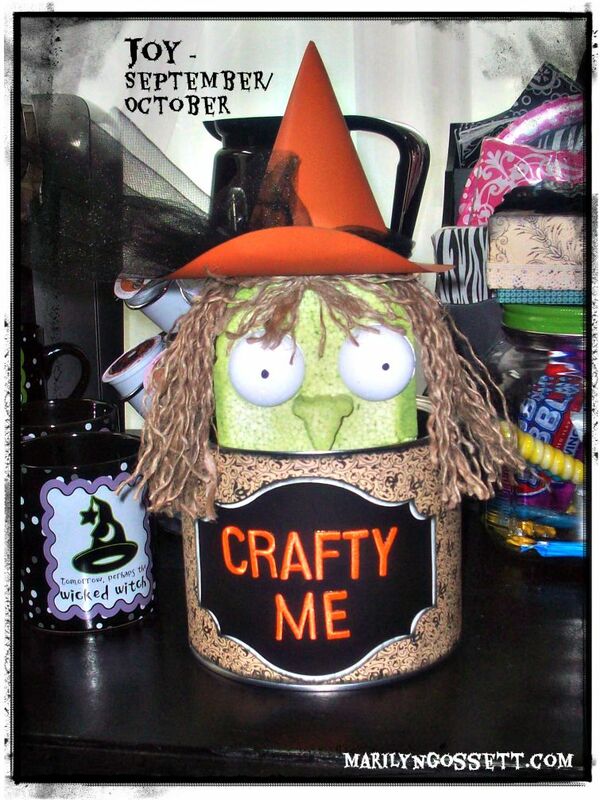 Create this fun little Halloween witch decoration with a recycled can, Smoothfoam and a few other supplies. Cut the 2 points off of one end of the Smoothfoam block, rounding the edges. Set the foam block in the can and press the front edges of the foam into the edge of the can. 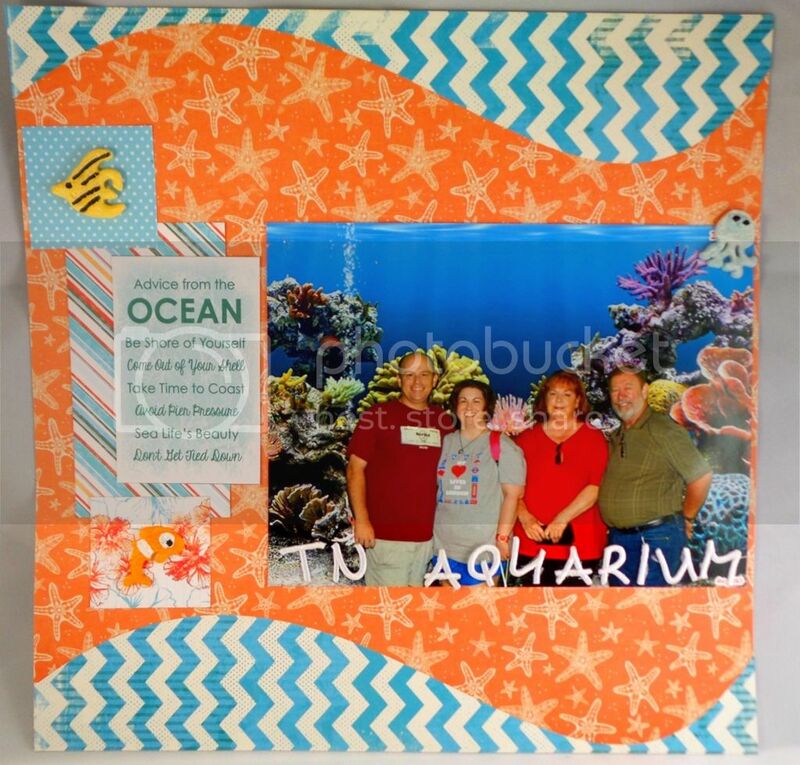 See the indentation marks in the layout photo above. Cover the can with Halloween patterned cardstock. Cut a nose from the scrap of foam. Attach to the block with half of a toothpick and apply a dot of glue to secure. Paint the entire block and nose green. Paint the half-balls white for the eyes. Allow to dry. For the witch hat, cut two 6" circles from orange cardstock. Shape one circle into a cone and adhere to the flat circle. 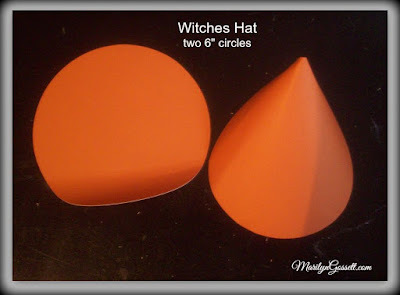 You might have to cut tiny slits in the cone to get it to lay flat around the edges. Tie a tulle bow around the crown of the hat and glue to the witch head. For her hair, cut about twenty 12" lengths of jute string. Tie in the middle and knot. Glue to the top of the head and trim as needed. 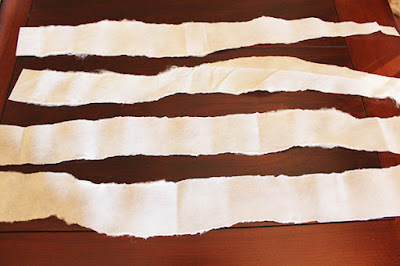 Use the same technique to make bangs, cutting the jute lengths much shorter. Unravel the jute to make her hair look fuller. 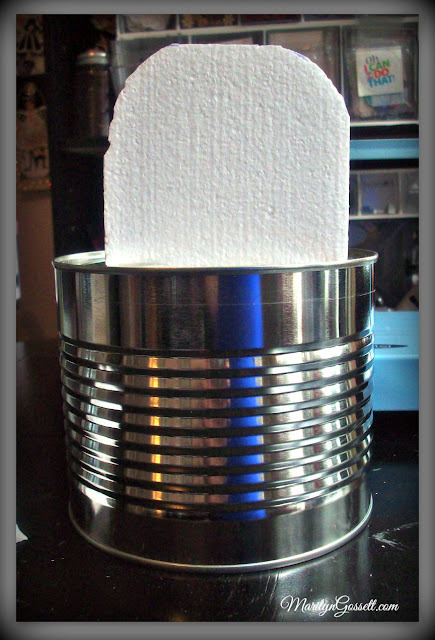 Use toothpicks and glue to attach her eyes to her face, then use a heavy-duty craft glue to adhere her inside the can, toward one edge. Place where the indents on the foam appear. Paint a black dot to each eye. Cut out the banners for the front of the can and glue in place. 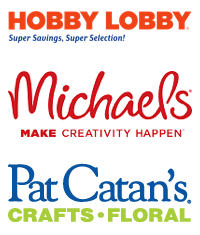 Glue the letters to the banner. Embellish the can further if desired. Hope you enjoy this project and that it inspired you to get in the s Halloween spirit!